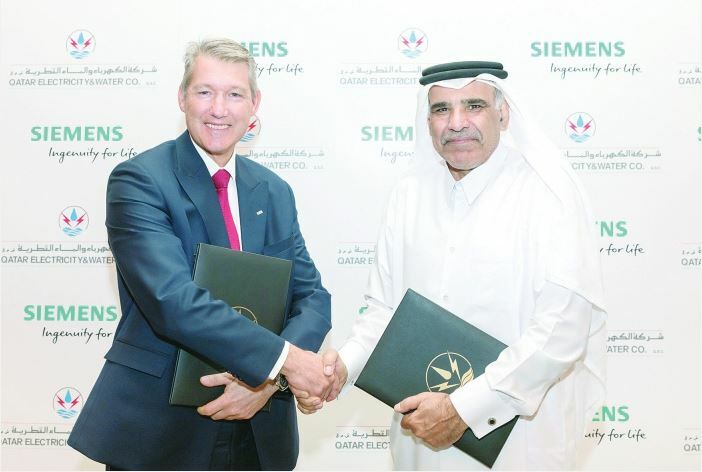 QEWC, Siemens sign MoU to train Qatari engineers | Qatar Electricity & Water Co.
Qatar Electricity and Water Company (QEWC) and Siemens signed a memorandum of understanding (MoU) on Monday, to cooperate on exploring opportunities for training Qatari engineers. The MoU also supports the development of local engineering talent, boosts knowledge transfer and enhances the maintenance and operational efficiency of QEWC power plant assets and the IPPs, a press statement said. The MoU was signed by QEWC General Manager and Managing Director Fahad bin Hamad al Mohannadi and Adrian Wood, CEO of Siemens Qatar. The two organisations agreed to collaborate on Siemens- supplied technology at QEWC facilities, including gas turbines, steam turbines, generators, ancillaries and controls, the statement said. Mohannadi stressed the keenness of QEWC to develop the Qatari engineers’ skills. Adrian said, “This MoU further strengthens our long-standing relationship with QEWC, ensuring their power assets continue to operate reliably and efficiently. Siemens has been working in Qatar since the 1960s and continues to be a key contributor to the country’s energy, mobility and city infrastructure. The company has recently handed over operations of the 2.5 gigawatt (GW) Umm Al Houl Combined Cycle Power Plant, which will deliver almost a quarter of the nation’s installed power generating capacity, and ensure adequate power and water supply for seasonal fluctuations and major events. Siemens is also building 35 turnkey substations as part of the nation’s plan to expand and strengthen its power network, under Phase 13 of the Qatar Power Transmission System Expansion project.